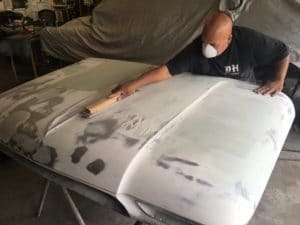 Creating The Perfect Paint Job, Step Four, Part B: Body Work | DH Automotive, Inc.
Hey there everybody, so here it is: this month is Part B of Step Four in our “Creating The Perfect Paint Job” series. Coincidentally, the “B” in this part, also stands for body work, which is what we’ll be taking a look at in this post. 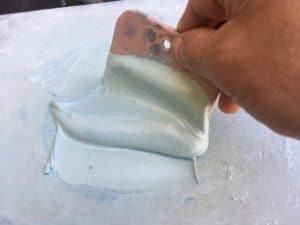 If you’ve been around cars at all, you probably know that this can be a bit of a taboo subject: that is the use of body filler or Bondo (the magic sauce, cream cheese, whatever you want to call it). You would want to purchase a gallon, which looks like grey frosting and the hardener usually red or blue in color, which comes in a toothpaste size tube. Way back a hundred years ago in our high school auto body shop our instructor (who looked like he spent time in a third world prison) used to tell us that Bondo (which was how it was called back then) was our friend. He told us to not be afraid to spread it thick, or not to worry if it is too much; he told us that we could shave off as much as was necessary to achieve the shape you desire.I’m not going to tell you the same is applicable several years later , however let it be known that using body filler is an all too common practice. The difference between a job well done and disaster boils down to using it very sparingly. Your goal is to smooth out the rough patches enough to lay down a skim of body filler to take care of any imperfections you might notice. Before I go off on a long winded rant however, let’s just get started. For the sake of giggles let’s say we have a few dents on the rear quarter panel of your vehicle. Regardless of any car or truck project if they are about a softball diameter and about a half inch deep (that’s when your grandma decided to whack the side with her walker) the most important tools you’ll need are a hammer and dolly set. Eastwood has a great set which is around $52 bucks, it is fantastic and will pay itself back two fold. 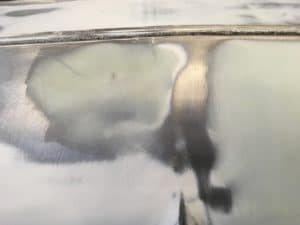 The idea is to straighten the metal and in some instances it might be necessary to use a gas torch, with the flame directed at the dent to allow the metal to become pliable. Next you’ll need to use the hammer and dolly to shrink the metal by “slapping it in a clockwise circular motion. If you don’t have access to a torch you can still achieve the desired effect. The procedure is as follows: taking the dolly in one hand and the hammer in the other preferably your dominant hand, place the dolly on the backside of the dent you are working on. Place the dolly firmly against the metal, then you would want to use the hammer on the other side and begin by striking the area with short taps, going in a clockwise circular motion. As the hammer makes contact with the metal, the dolly will “jump” away from the underside – do not fight this motion. Allow the dolly to pull away then bring it right back in contact with the metal, so it will sound like a two step, first hitting the metal, second the dolly tapping underneath. After a while you’ll be able to move smoothly over the dented areas in short rapid fires with the hammer. Once you are satisfied with the area (making sure there are very little ripples or high spots), it’s time for the body filler. Get yourself a palette and think like a painter. I like to use a sturdy 12 inch x 12 inch aluminum square to mix the body filler with the hardener, after which apply a softball sized diameter of body filler (grey frosting) and a quarter size of the hardener (blue or red). You’ll need a spreader – they have plastic ones in various sizes at your local auto parts store. Some guys prefer the flexible aluminum ones, but choose whatever you like. A little trick I like to employ is to apply the hardener alongside the filler, but making sure they don’t touch each other so that it gives you time to get situated before you begin mixing. Bring the two compounds together utilizing a figure eight motion, all the while scraping off the excess and folding it into the mix. 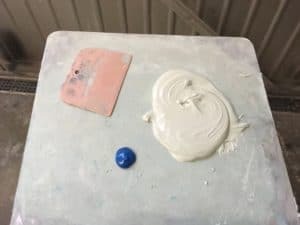 Once the filler turns baby blue or pink (depending if you are using red or blue hardener), it time to spread on the mixture. Now here comes the tricky part – you only have a matter of minutes before the filler begins to harden. If you wait too long, it will become like the Mexican Cotija cheese which means you will have to start all over again. 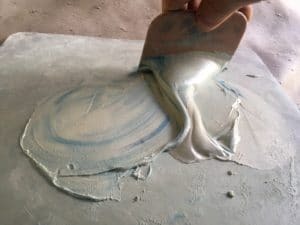 Also you want to move quickly in scooping up any remaining filler on your spreader so that when it fully cures, you can bend the spreader and the excess bondo will pop off, thus leaving your palate ready for the next batch of filler. You want to spread the filler using long strokes and apply it generously. If you have a few imperfections in the vicinity of another one, you will be best off if you cover the entire surface, remember we will be taking off most of it. Here’s a trick, only go over the sections one time maybe two, you can get hung up with making it perfect, which will limit your time applying all the areas you needed to cover. Once the filler has set up, it’s time to bring out the blocks, and begin the shaping process. In really thick areas I use a 40 grit sandpaper, but most of the time I start off with 80 grit and work my way down to a fine 400 grit. Note that higher the number on the sandpaper, the finer the grit will be. You want to use long controlled strokes and stay away from the temptation to use your bare hands, as this will cause waves which will show up down the line and not give you the glass like finish you are looking for. When sanding wear a mask to protect yourself from breathing in those fine filler particles, and use a cross-like motion when you’re sanding as to eliminate any deep scratch marks. The idea is to feather or smooth out the filler so that when you run your hand over the area, you can’t tell where the filler or the metal begins. 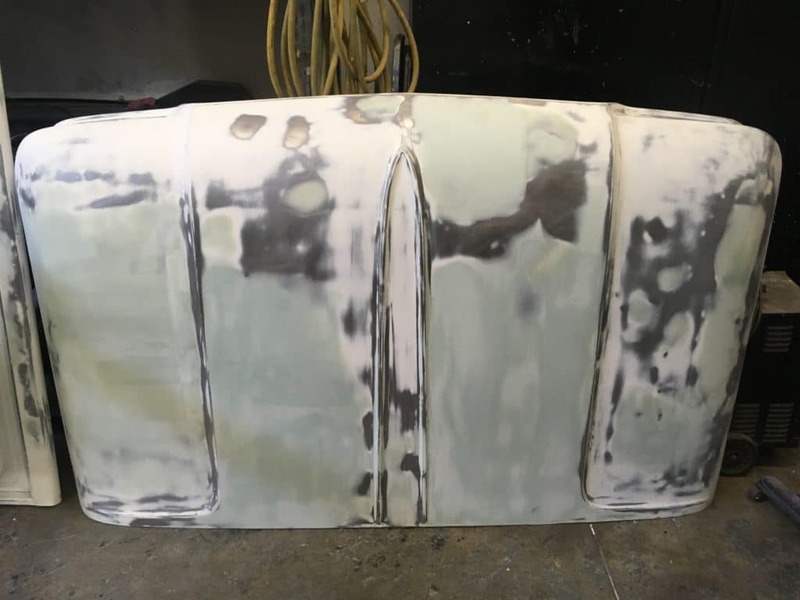 After you’ve applied the filler and sanded out all the rough spots, it’s time to apply primer which will fill in any slight imperfections in the body work, depending on what primer you use. Next month I’ll be discussing the “Blocking of The Car” which is crucial for a perfect paint job.